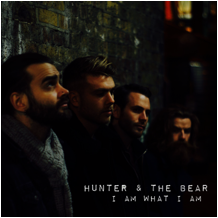 Ahead of their much-anticipated debut album set to drop in Spring 2017, UK rockers Hunter & The Bear release the brand new single ‘I Am What I Am’. In contrast to the high-octane, raw energy of their previous offering ‘Who’s Gonna Hear You?’, their new single presents a deeper, more sensitive aspect to the band that highlights their skills as accomplished songwriters. ‘I Am What I Am’ is a song full of feeling that provides an honest and emotional portrayal of human relationships, delivered with the charisma that has built Hunter & The Bear a fierce reputation and cult following throughout the UK, Europe and beyond. Fresh off the back of the bands’ show stopping performance at the Unsigned Music Awards held at London’s Troxy in October, Hunter & The Bear continue to attract an ever increasing swathe of positive attention as a band who are leading a strong resurgence of rock & roll into the UK music industry. A pivotal moment in their career to date emerged when they caught the ear of rock icon Eric Clapton, who subsequently invited them to support him on his most recent UK arena tour. Since then the band’s tenacious attitude to touring has seen them win a legion of fans wherever their live show takes them, packing out tents at Reading and Leeds, headlining European festivals and captivating a range of followers across the globe. ‘I Am What I Am’ is a song that will speak for itself, set to introduce a new audience to the band’s unique and inspirational work. With a much hyped headline show at new venue The Camden Assembly on 1st December, followed by an extensive tour of Scotland in 2017 and multiple dates around the UK and Europe to follow, Hunter & The Bear continue to progress from strength to strength.